Dezeen promotion: German bathroom and kitchen manufacturer Grohe is aiming to reduce paper wastage with its latest toilet model, which doubles as a bidet. 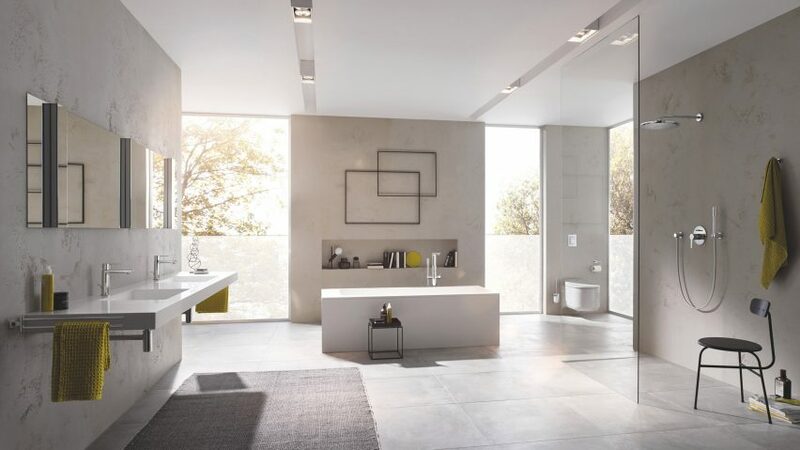 Described by the brand as a "shower toilet", Grohe's Sensia Arena model has a built-in water nozzle that can be used to naturally cleans users. Users can choose between gentle, strong, or oscillating spray settings, or opt for a separate nozzle head that has been specifically designed for cleaning more intimate areas. "The Grohe Sensia Arena transforms the everyday routine of a visit to the toilet into a miniature ritual of well-being," explained the brand. In addition to the bidet feature, the brand has also incorporated a ventilator system in the toilet that shields and extracts odours, before processing them through a carbon filter. The inner bowl has also been lined with Grohe's HyperClean glaze that uses silver ions to eliminate germs and bacteria, along with their AquaCeramic coating which prevents the settling of dirt. Other features include a motion sensor that opens and closes the toilet lid, and a small night-light that guides users to the seat in the dark. A Sensia Arena smartphone app has also been developed where users can save their preferred cleaning settings – these can alternatively be changed using a hand-held remote or the control panel that's on the side of the seat. The colour of the toilet's flush button can be customised so that it corresponds with existing bathroom designs – options include "graphite" grey, brassy gold, and a coppery brown. Earlier this year Grohe released an "intuitive" shower system that is able to memorise user's water flow preferences and easily alter spray power. The brand has also developed a range of tap fittings that can emit chilled, kettle-hot, or sparkling filtered water. To find out more about the Sensia Arena, visit Grohe's website.